Creating a game that resonates means keeping these principles that we’ve outlined in mind throughout the design process. And it means doing so in a serious way, not just checking a box that you’ve “created a strong narrative” or “made space for imagination.” With that in mind, the principles that we have outlined are summarized below. The principle of cultivating player identity—Trying on and exploring a new identity in a game space provides an opportunity for players to incorporate new aspects into their real-world identity. The principle of scaling across time, space, and users—Game experiences often become deeper and more meaningful when they are played over time, with people across distances, and with large numbers of other players. The principle of preparing for future learning—Experiences where players construct their own knowledge form a solid foundation for subsequent learning activities to build on. The principle of deepening complexity—Deep learning can be supported by designing levels or sequences of tasks that increase in complexity in interesting ways, challenging players to experiment further. The principle of guiding reflection—Explicit reflection activities facilitated by a mentor can illuminate how far players have come and solidify what they learned from and enjoyed about the game play. The principle of providing multiple pathways and freedom of effort—Providing multiple entry points into a game experience, through choices in content or task, allows a feeling of autonomy and personalization. The principle of social design for learning—Game features and implementation strategies can both create social connections around a game that encourage players to collaborate and learn from each other. The principle of narrative and imaginative cocreation—Weaving a strong and imaginative narrative throughout a game experience is one way to engage players and foster creativity by leaving space for them to participate in that fiction. The principle of providing authentic problems—Creating realistic settings in which to use the target skills motivates students to solve problems and helps them value those skills. The principle of designing systems for exploration—Games based on systems with interesting relationships that provide meaningful choices for players necessitate experimentation and analysis and interpretation of the outcomes. The principle of working within an educational system—School districts and other educational systems must be taken into consideration in the design of any game that will function within that system. Games that are designed thoughtfully and flexibly will be more accessible and easily adopted. The principle of providing professional development—Teachers using innovative games that involve alternative pedagogies need training, support, and access to peer communities o effectively implement those games. The principle of making curricular connections—Skills and practices, not only content knowledge, can be taught within games in unique ways. Drawing out these goals explicitly in bridge curriculum activities can build on and solidify the learning. The principle of creating a culture of inquiry—An inquiry-based game must be supported by a culture of inquiry in the surrounding educational setting. The expectations set outside the game influence players’ sense of ownership and motivation inside the game. The principle of integrating into everyday life—Games that are designed to fit into the spaces of players’ lives can be woven into their daily activities and real-world experiences. The principle of connecting data to practice—With training and practice, teachers can use game data to inform their classroom practice in beneficial ways. The principle of designing adaptive experiences—Task sequences that adapt difficulty and content based on player actions can engage and scaffold in valuable ways. The principle of codesigning with educators—Bringing teachers into the design process early and often leads to a more grounded and usable final product. The principle of working with the right partners—Game projects benefit from partners that fit the projects’ goals and provide complementary expertise. The principle of facilitating lifelong learning—Considering design elements specific to lifelong learners will make the game more relevant and more accessible to players outside school. The principle of fostering communities of practice—Communities of practice for players, educators, and even designers can greatly benefit the process but must be supported intentionally. The principle of applying skills to daily life—Both game features and curricular materials work together to demonstrate authentic context and tie game play to real-world situations. If we think of these principles each time we design a game, why then do we create such different games? The examples that we have provided here are really quite varied, ranging from short casual games like Farm Blitz to long-form games like Radix and even games that blur the boundary between game and life like Vanished. Across these cases, learning goals and context vary. Consider Vanished. The goal of Vanished was to promote scientific thinking and discourse among middle school students outside school in partnership with museums. So there was a goal (promoting scientific thinking and discourse), an audience (middle school students), and a context (outside school/connections with museums). Some principles rose to the top fairly quickly from these constraints. The principle of social design for learning was necessary to address the goal of student discourse. Slightly less obvious, perhaps, the principle of narrative and imaginative cocreation also quickly became a central pillar of this design. Engaging middle school students over a sustained period is a challenge, particularly when this is done outside school. So a narrative with prompts to spark students’ own imaginations provides a hook and a way to sustain the engagement over time. Other principles were important as well, though not all were of equal prominence. We considered principles concerning inquiry, connectivity, partnerships, and codesign, for example, fairly regularly, but they were not as prominent as the social construction of knowledge, which was absolutely critical. On the other hand, some characteristics of the project made it easy to ignore or significantly deemphasize some principles. Being an outside school intervention, principles of professional development and curricular connections were of much lower importance. Working with middle school students, the notion of lifelong learning was not as relevant either. Ultimately, we had a core set of guiding principles that we heavily emphasized, many more that were relevant but not of the prominence of the guiding principles, and a few that were irrelevant or significantly reduced in relevance. We wound up with a variable emphasis on the principles as applied in this particular game that might be visualized as seen in figure 9.1. 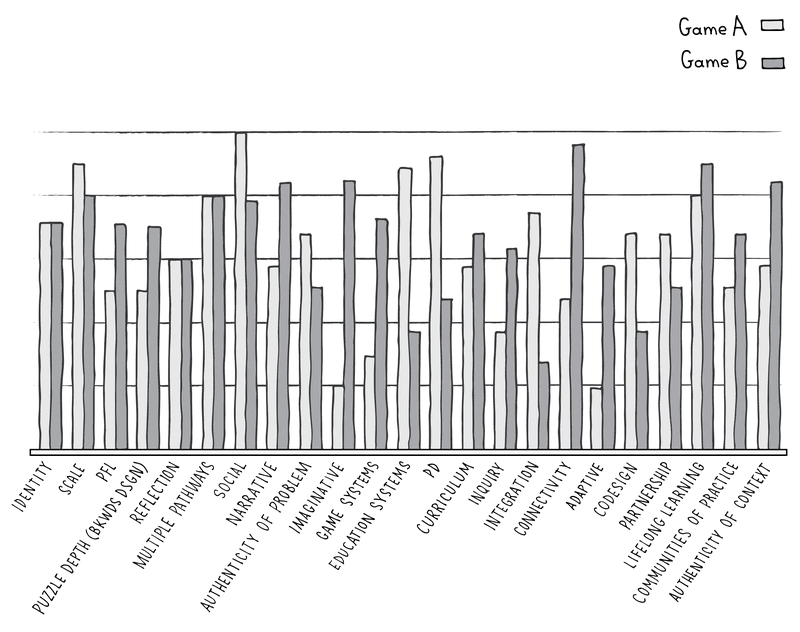 Figure 9.1 A sample scale showing the relative importance of the resonant games principles as applied in a given game, such as Vanished. In contrast, consider Radix, a game that also had scientific thinking as one of its goals but without the emphasis on discourse per se. Radix was a game for high school students delivered primarily in school. It also had some specific curricular goals related to biology and math content, as well as a goal of enabling students to experiment with scientific systems like players do in many MMOs. So while there was some overlap of desired learning outcomes, the combination of constraints and goals resulted in a different emphasis and resulting design. The principle of designing systems for exploration was of high importance, relating directly to the MMO systems that we wanted players to be able to experience. Since Radix was being used in schools, making curricular connections and working within educational systems were important principles we needed to follow. The depth of the game and the unfamiliar genre to many teachers required us to emphasize the principle of providing professional development. While a few of the principles, like the principle of applying skills to everyday life, were of lower importance, the scale and scope of Radix required calling on most of the other principles in its design. Still, not all the principles can be of equally high importance. We need to establish a few as critical pillars to the design, with others playing an important but supporting role. If everything is critical, the project can quickly grow in scope and spiral out of control. So in contrast to Vanished, our emphasis may have looked something like the comparison shown in figure 9.2. Figure 9.2 A comparison of the relative importance of each of the different principles in two games, Radix and Vanished. The numbers represented here aren’t exact, but the figure shows that depending on the project, we really need to look to some principles as central guides and others in a supporting role. The way we emphasize these principles steers the design of each game. There is no one right way to weigh the principles for a particular project. And there is an art to this balance as well as a science. The keys to establishing an effective balance are rapid prototyping, frequent play-testing, and design-based research that enables the calibration of these principles for the particular goals and audience. It would certainly be possible to create an interesting MMO that would hit similar goals as Vanished, or an ARG for schools that could teach content and scientific thinking skills like Radix. Though it might be hard to create a single-player casual game for either of these. So the principles and even the weighing of those principles don’t provide a fixed formula for creating the perfect educational game. Games are “designed experiences” (Squire, 2006), which means that game play and outcomes are very much tied to the players and their experience both inside and outside the game. That combination is so widely variable that we can’t possibly try to boil it down to a simple formula. But what we can do is focus design on productive practices and processes. And we can also design playful environments that provide the freedom to explore, the freedom to fail, freedom of identity, and freedom of effort. Thinking about the principles in this way does guide the design process significantly. But the educators and designers still need to design the experience. This variation also has lessons for development. Over the years, we have been asked numerous times either to develop or to participate in a conversation about the development of “the” educational game platform. Given the diversity of genres of games, kinds of interesting data, ways of structuring interactions, and contexts of implementation, there is no way to create a single platform to cover the necessary productive variations. Even “the web” is too narrow, as games may be on smartphones, VR devices, or any number of new forms of digital interaction. If the educational game platform isn’t the next frontier, then what is? And where else are the pitfalls that we should avoid? Educational games have made some remarkable inroads in the last decade. A 2014 survey (Takeuchi & Vaala) of K–8 teachers in the United States found that nearly three quarters of the teachers used digital games in their classrooms. Granted some of these uses are trivia games for basic recall, but the widespread usage suggests a much broader acceptance for games as a part of learning than we saw a decade ago. But there is still work to be done to get to a place where meaningful games are broadly used as a regular part of practice in a way that resonates with both teachers and students. We see seven big areas that are both demanding innovation and providing opportunities in the coming years—research, funding, partnerships, distribution, data, platforms, and ungamification. There is a need for both more research and new kinds of research. The results of this book are based on years of design-based research. This methodology is a cornerstone of the field of educational games. We need to iteratively and methodically design, build, test, and refine our products to make sure they meet the requirements of the communities in which they are to be integrated, as well as the goals of the designers. But sometimes shortcuts are taken to get a product to market. We can’t shortcut this process and need to take the research seriously. At the same time, there is a demand for “rigorous” research of what works in education, as we discuss in chapter 8. We should fulfill this demand as well, which requires innovative ways of thinking about research methods. While the research should be rigorous, it can’t just follow the methodologies from other domains like medicine. As seen in the recent reproducibility crisis in psychology, experiments involving human thought and interaction are notoriously difficult to replicate (Open Science Collaboration, 2015). Instead of seeking the perfect experiment from which we can prove the worth of a particular intervention, we should instead be creating interesting series of experiments, each of which offers unique insights into what is or is not working about a game in a given context with a specific population. From these kinds of data, achieved through mixed-method research, we will learn not only about the particular product of study, but also about some more general principles that can be applied to other products. Research should guide continuous improvement and help create guidelines for implementation. 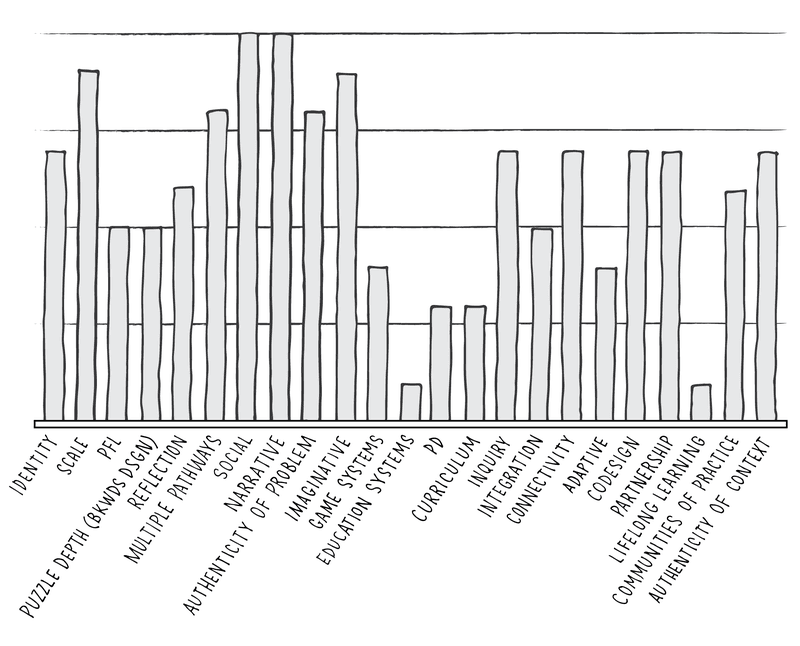 For example, in our research on Radix we collected data about student scores on tests. But along with these data, we collected data about teacher implementation, student usage patterns, and context for the activities. By controlling this study more thoroughly, we would have missed out on interesting research questions about context (for example, where in the lesson sequence teachers used the game), and we would have needed to enforce an implementation regime that may not have worked when teachers actually got to choose. As a field we need to advance our research methodologies, thinking about new kinds of data that we can collect (e.g., in game analytics) and what kinds of questions we want answered with those data (e.g., where and when will students play mobile math games, or what is the role of narrative in short-form science games). Ultimately these kinds of research questions can help define and refine the kinds of principles that we have outlined here. Funding for the development of educational technologies is a complex and dynamic landscape. Many advances in educational technologies have come from research labs and universities. Federal funding through the National Science Foundation and the US Department of Education are primary among the funding sources for this work. The challenge with this kind of funding is that it is designed to promote innovation and research, but not sustain products. So when a lab creates a game or other educational technology, the funding will support the development, implementation, and research, but once the funding has run out after a few years, there are no means to support the product. That means no training, technical support, or updates for changes in platforms. It is challenging for teachers to be able to rely on products without that kind of support. On the other side, there is a new wave of startups in the educational technology space. There are incubators devoted to educational technologies in many communities (including Learn Launch here in Boston). The challenge here is that innovative and transformative products take a long time to make money, and the venture capital–funded startup space doesn’t give these products much time to turn revenue positive. What often results in these spaces are pivots to products and services that fit more easily with the existing set of constraints, or collapse. Look at some of the heavily funded efforts like Zynga and New School Venture Fund’s Co.Lab, which has now folded after a few years (with some successes along the way), or GlassLab at EA games, which has moved primarily away from game development to instead provide services and infrastructure for educational technology deployment. The challenge is that neither model alone allows for significant innovation as well as revenue and sustainability. Another alternative is a hybrid approach, in which research labs and industry can partner, with the former taking on the role of risk taking and innovation, while the latter keeps an eye on what will actually sustain a product. We document one such venture in The More We Know (Klopfer & Haas, 2012). That book documents a collaboration between our group at MIT and NBC News on an online learning portal initially focused on games. The venture was a success in some regards, as it led to an ongoing learning venture from NBC News, but it was a failure in that the portal does not use games. Still there are lessons to be learned there, and more opportunities for such partnerships to experiment could potentially lead to greater success. The federal government has also recognized the need for both spurring innovation and encouraging transfer out of universities and into companies that can maintain and grow these efforts. Through federal programs like Small Business Innovation Research and Small Business Technology Transfer, several federal agencies support work in the educational games space, funding partners such as Filament Games, with whom we worked on Radix. Another program, I-Corps, addresses another issue around university research spinoffs, which is training researchers to think like businesspeople. There are a lot of potential bottled up inside research universities and nonprofits, which can lead to products, but they need the resources and personnel to help with that transfer. The funding challenge is connected in many ways to the challenge of distribution. For games to have an impact, they need to reach their intended audience. In some cases, like most of the games discussed here, that is a matter of getting teachers and students to know about and use the games. But most research grants don’t cover marketing as a line item. While many distribution and messaging channels may be free or cheap on the Internet, effective marketing through these channels is difficult and requires resources. We should not expect good ideas to just spread virally; they need to be crafted and curated. Distribution also often requires a personal touch, making connections face to face and with communities spread around the country. That requires additional effort and resources that often aren’t covered by funding. The most challenging part of distribution in the precollege market is that it is highly decentralized. While a few states such as Texas have centralized purchasing of textbooks, most marketing of software is done district by district, school by school, or even teacher by teacher throughout the United States. That makes distribution a significant challenge without a marketing network. This is one of the reasons why textbook distributors have held on to their market position. They have developed and maintained massive networks that retain marketing capability despite their product lagging in many ways. In a recent conversation with a venture capitalist investing in education, when he was asked about the K–12 market, he flat out said that he avoids that market, and sticks with the home, professional, and postsecondary markets because of the inherent complexities in K–12. There are a few success stories in this space. Discovery Education, Brain Pop, and even NBC News, as well as a few others, have managed to build successful digital education businesses. But the challenges are numerous, and work needs to be done. There is a lot of interest in centralized marketplaces, that can be the “app store for education.” Edmodo, Google, and others have tried with varied amounts of success. Many smaller platforms currently exist. Perhaps such a platform could spread if supported by an independent entity. For actual success, the platform needs to be accompanied by policy. Purchasing and budgeting provide additional challenges to widespread distribution. Software that serves narrow purposes (perhaps for only one subject or even one topic) is difficult to purchase in a market set up for all-encompassing textbooks. While it would be wonderful to provide all these services for free to schools, that model is rarely compatible with sustainability. We need support and innovation for business models that can succeed in marketing and sustaining products. We discuss many aspects of partnerships in this book, including partnerships with developers, museums, nonprofits, corporations, and schools. There are more partnerships to be found in the future. Some of those might be with marketing and distribution partners, as discussed in the previous section. Yet other partners might provide insights and innovations for the next generation of learning games. There is currently a great deal of interest in cognitive science and what research in this domain might be able to contribute to learning. In turn, cognitive scientists are quite interested in the data and insights that can be generated by well-designed learning games. Early forays (and follies) in “brain training” like Lumosity aside, there is a connection to be made. We don’t think that the all the answers to design are held in analyzing brain scans, nor do we believe that the tightly controlled experiments of cognitive science will translate to the broad range of conditions found in real schools. But we do think that insights can be learned from this field, and that we can contribute complementary insights in return. Similarly, there are many aspects of computer science that show great possibilities for game design. Artificial intelligence has long been a part of game design, creating non-player characters (NPCs) that respond in natural ways and provide continuous challenge. There is much more to be explored, perhaps identifying not just right and wrong ways of solving problems in games, but identifying why answers are right and wrong so that the player can be given specific remediation and subsequent challenges. Natural language processing is still fairly rudimentary but may soon be able to create an interface with a much richer set of inputs from players. In these cases, the greatest benefits will come not from simply appropriating research from these other fields, but by creating collaborations with them. Learning can be bidirectional and lead to advances in both game design and the corresponding domains. While data and data science can be thought of as yet another field with which to collaborate, they are so important (and somewhat nuanced) that they deserve special attention. We discuss in this book ways in which we’ve used data from our games. We’ve tried to understand where players are succeeding and failing in Radix, teacher usage patterns in UbiqBio, and what marketing works in our partnership with Commonwealth. These methods are only scratching the surface of what we can do with data. Some designers take the perspective that games should just generate a lot of data, and we will be able to make sense of it with data mining after the fact. This kind of “fishing in the exhaust” (Reich, 2013) may occasionally offer interesting glimpses, but without a priori theory and well-designed experiences, the best that they can offer is conjecture. The most useful insights will come from games that carefully design experiences to create meaningful data trails. That was what we did in Radix, creating quests with series of actions that tell us not only what students have done, but what they understand as they accumulate more data. This gives us a better picture of their systems understanding, not just their mastery of facts. Designing experiences this way is challenging and resource intensive. As we better understand the data and how we can use them, we may in turn be able to both design better experiences and do so with greater ease. Platforms like Adage (Halverson & Owen 2014) aim to accomplish this. By providing a common platform for collecting, storing, and analyzing data, designers can offload some of that work to common frameworks. There is still much more to be done in this area, and researchers in data science, visualization, education, human-computer interactions, and game design all need to collaborate to use data in significant ways. Schools are constantly chasing hardware platforms. Since computers have entered the consciousness of schools, educators have paid more attention to the hardware than to the software. Computer labs, teacher computers, laptop carts, tablets, and Chromebooks have all had their phases, and today one can find many schools engaging in any and all of these. And many schools are seeing a mixture because of bring-your-own-device (BYOD) policies, which allow students to choose a device to bring with them. Overcoming the challenges disseminating to schools means figuring out the platform challenge as well. But tablets, laptops, and phones are fundamentally different. And new platforms coming down the road also have new affordances. While there is a lot of discussion about “mobile first” technology development strategies, which are designed primarily for mobile platforms, for educational products this means simply shrinking things down to the appropriate size. But truly “mobile first” design means accommodating for not only screen size but context for use, and ideally is enhanced by the affordances of mobile, rather than merely mitigating for the shortcomings. Take, for example, the UbiqBio games. These were designed to be played in short bursts of time and require simple actions, well suited to the mobile experience. While Radix could be shrunk and ported to a phone platform, it wouldn’t work well without a lot of adaptation. Instead what we’ve thought about is a companion app that might allow you to do Radix-related tasks on your phone between full Radix sessions. As many students from middle school up consider their phones their primary platform, there is a lot of opportunity to do more, and more interesting activities on that platform. The choice of platform can make or break an experience. For many years we developed mobile participatory simulations, first on custom wearable computers (Collela, 2000) and later on some of the early PDAs of the time, like Palm Pilots (Klopfer et al., 2005). Through the use of these technologies, a whole class became a decentralized simulation. In the most well known of these examples, everyone in the class had a PDA with a character on it. They could go around and “meet” other players by using the short range (line of sight and about one foot) infrared communication abilities of these devices. Eventually some people would get “sick,” and the mission then became to figure out how and why. This kind of simulation was very popular with teachers because they could use novel digital technologies to address complex issues, but they could facilitate the activities in a familiar way. As wireless and mobile technologies progressed, we tried to recreate this platform on smartphones and tablets, but have continually struggled. While the proliferation of devices and the ease of networking makes the technical aspects of these simulations easier to create, the shift from short-range to long-range communication capabilities has fundamentally changed the nature of these activities. Short-range communication required face-to-face interactions; long-range communication does not. Redesigning around these new platform affordances requires fundamentally rethinking the mechanics of these games in the context of the platform to create the desired classroom dynamics. Now we are starting to see the rise of virtual reality (VR) and augmented reality (AR) platforms. The Oculus, Vive, and Hololens are emerging, along with other new platforms. In some ways, simply experiencing 3D content with one of these VR or AR platforms is very exciting. But here, too, transformative learning experiences will only come when designers figure out how to take advantage of the unique aspects of these platforms. Early efforts to create immersive field trips or port 3D games show the potential of these platforms, but they also show that we have a long way to go before we really take advantage of them. Seeking more advanced high tech is not necessarily the pathway to success. There is a resurgence in interest in lower tech as well. Board, card, and role-playing games are seeing an increase in popularity with both players and designers. On-demand game production sites and crowdfunding have brought a lot of interest to these neglected game forms. There is a lot of innovation happening now, and opportunities to create games that embody many of the principles we’ve defined without the technical challenges of digital games. The bottom line with any of these platforms, though, is that the same principles we’ve outlined here hold true. While the technology may introduce new ways in which the principles can be applied, the basics of design, partnerships, and implementation remain the same. Many of the trivialized elements of games have now become pervasive throughout our daily experiences. We see points, leaderboards, and achievements in everything from exercise applications to online learning to monitoring of daily habits. These “gamified” applications are based on the principle that these game elements will make these tasks fun and motivate people to persist. It is our assertion that while this may be true in the short term, in most cases, this kind of feedback doesn’t teach an appreciation for the underlying activity, and in the long run will be counterproductive, as the activity will not persist without the accompanying reward. We believe that the principles we’ve outlined here can be applied in many contexts to activity design, and that many kinds of educational activities can benefit from their application. This application needs to be done with thought and care, baked into the design from the start, not simply layered on to other activities after the fact. We certainly encourage these principles to be adopted and adapted in many applications. But it should be done in a way that can carefully consider how to apply a whole set of principles to the experience. For better or worse, the hype cycle has passed in the world of educational games. We actually believe that this is mostly for the better. It allows people to focus on what is great about this medium and design meaningful experiences. And we can now set reasonable expectations as to what to expect. There is still a huge opportunity in front of us. Technology is improving and making exciting new things possible. Independent game developers are providing exciting innovations in game design that can be applied in educational game design. And new markets are opening up to games, including nontraditional learners and international markets. While the hype has passed, the excitement has not. The next wave of resonant games has the potential to resonate with a wider audience and make an even greater impact. Let’s make it happen.